This is a beautiful, quiet inn in a beautiful setting, with a wonderful view of the mountains. The food is great, with outstanding breakfasts and dinners, and the service warm and friendly. One of our favorite places anywhere! We stayed in the Webb Mountain House and really enjoyed our time there. Everything from breakfasts to the house to the grounds were perfect for our family of 4. We enjoyed the afternoon snacks as well as walking the nature trail to visit the swan. 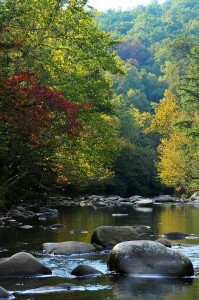 The inn’s location is great…not too close to the busyness of Gatlinburg but not too far away from everything either. One thing I would point out is that the Webb House was supposed to have WIFI but it didn’t work most of the time. We weren’t too upset about it though since we ended up reading many of the good books lining the shelves inside the house. We will definitely return to the Buckhorn in the future. This was our 2nd visit to The Buckhorn Inn. We love B & B’s and the Buckhorn tops our list. The staff is always pleasant. The breakfast’s are the best!! We stayed in the Tower room. Boy that was fun. It does have 26 steps up so be prepared. 1st floor has patio, 2nd is bath and 3rd is bedroom with windows all the way around. It was like staying in a tree house. We truly had a great time. They have beautiful garden’s and close drive to all area activities. This is the best place to stay in Gatlinburg!! We had a wonderful time at the Painting Retreat at Buckhorn Inn. As usual, the staff was awesome. They were so attentive to all of our needs. The innkeepers were so warm and friendly. The inn was immaculate. And the gardens were delightful. The breakfasts and the dinners were fantastic. I can’t seem to say enough about our fabulous stay. My husband and I went for his birthday for dinner. The food, ambiance, and staff were absolutely incredible. We had the Filet and it was the most tender steak I have ever had. The flavors in everything was simply wonderful. The food is simple but elegant and tasty. The staff are friendly and efficient. The price of the meal was more than fair. The only thing that made me sad was when I had to leave after dinner. I did not want to go home. This place is a real hidden gem. The property was beautiful and wish we would have had more time to explore. I will definitely be back! Best dinner experience we have ever had and at our age, that is saying a lot as often as we travel and dine out. Just Go! !